DragonflEye was created by genetically modifying regular dragonflies with steering neurons in the insect's spinal cord. One of the biggest challenges the drone technology is facing, despite advancing at a rapid speed, is reducing the size of the flying robot. The smaller the drones are, the better are the chances of them being used for purposes both practical and devious. So, in order to overcome this challenge, researchers at Charles Stark Draper Laboratory and Howard Hughes Medical Institute in Massachusetts have developed a programme that may sound like a concept from a sci-fi movie but is definitely effective. 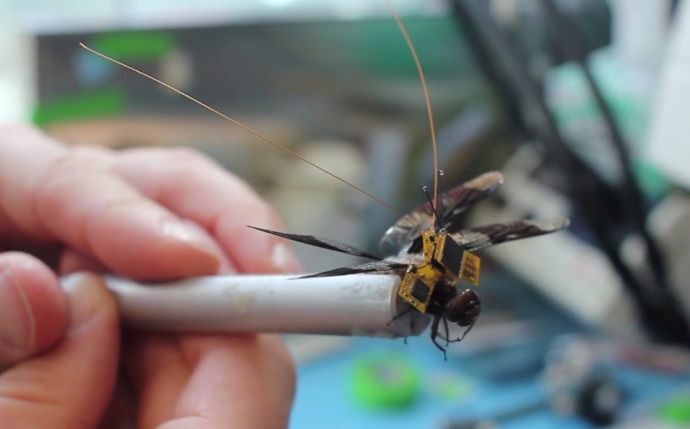 The researchers have developed a tiny backpack that can be fitted to live dragonflies in order to turn them into an insanely futuristic cyborg dragonfly ‘drone’ which the researchers can remote control. “DragonflEye is a totally new kind of micro-aerial vehicle that’s smaller, lighter and stealthier than anything else that’s manmade,” said Jesse J. Wheeler, a biomedical engineer at Draper and principal investigator on the program. DragonflEye was created by genetically modifying regular dragonflies with "steering neurones" in the insect's spinal cord, which are light sensitive. Tiny, fiber-optic-like structures in the dragonfly's eyes send pulses of light to their brains, functionally controlling where the insect flies via remote control. The tiny ‘backpack’ which is attached to the back of the insect carries sensors and a minuscule solar panel to harvest enough energy to power itself without the need for batteries. In theory, the dragonfly will be able to be steered by the researchers and will collect data via its sensors from environments that aren't safe for humans. 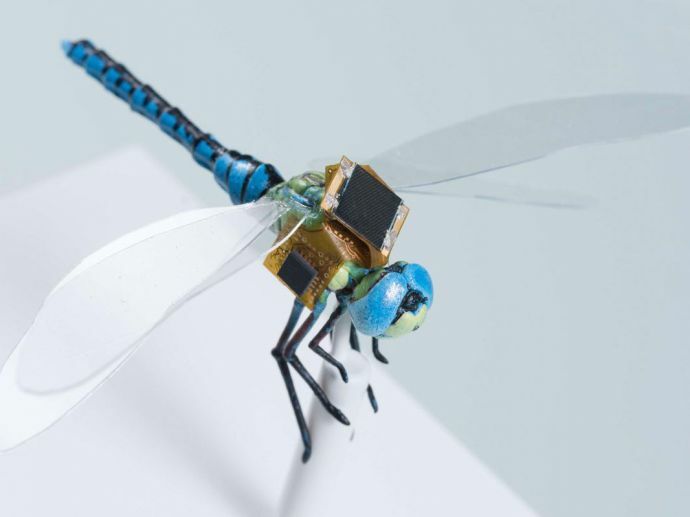 The scientists are guiding the flightpath of dragonflies in order to use them for guided pollination, payload delivery, reconnaissance, precision medicine and diagnostics. “This system pushes the boundaries of energy harvesting, motion sensing, algorithms, miniaturisation and optogenetics, all in a system small enough for an insect to wear,” Wheeler added. 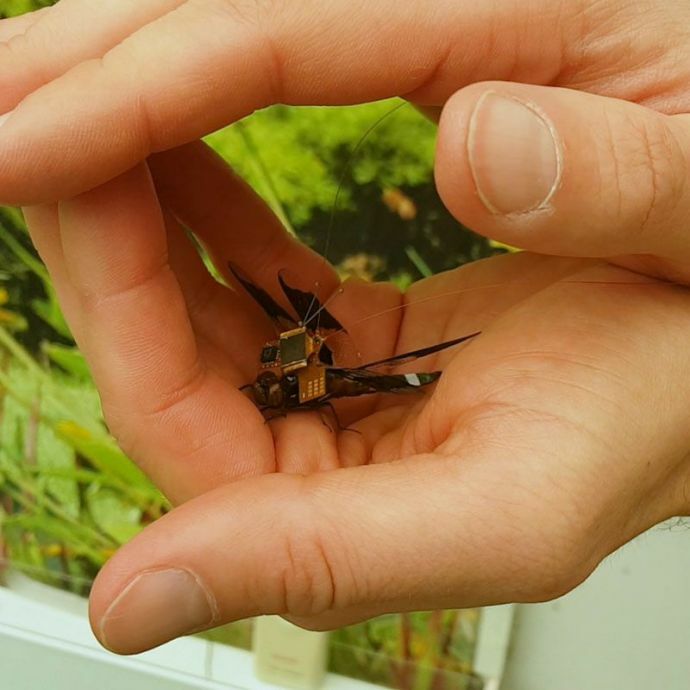 “The smallest aerial drones mimic insects in many ways, but none can match the efficiency and manoeuvrability of the dragonfly,” quotes the website. The researchers aren’t just hoping to use them on dragonflies- the technology could also be used on more of the Earth’s smallest and most agile insects, for instance, honeybees.